Rather than simmer beneath the surface, anger boils over on the pages of this first novel. Murray perfectly captures the patois and fury of the Mexican women of the East L.A. neighborhood of Echo Park. Here, the gang hierarchy is set in stone. There are jefes, right hands, taggers, third raters and sheep, the last being the girls who shut up, pose prettily at rumblas and carry babies for the men. Narrators Lucia and Cecelia, however, do not fit this role: Lucia wants to be a grandola; Cecelia sees herself as ugly, a ""dirt dark Indian"" who can't hold on to a pregnancy or a girlfriend. 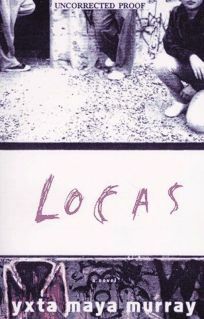 At the outset, the gun-dealing Lobos gang prevails, led by Manny, who is Cecelia's brother and Lucia's lover. As cocaine supersedes guns and upstart rival G-4s challenge the Lobos, the two women struggle, exhibiting a depth of character that sets them apart from other women in Echo Park. In portraying Lucia's unrelenting criminal meanness and hunger for power and Cecelia's ultimate resignation to a life of praying and cleaning rich rubias' houses, Murray gives readers inner-city gang life from the eyes of women. Both narrators' voices are insistent, unvarnished, in-your-face tough. The reader equipped with a Spanish-English dictionary has the best chance to grasp all the nuances of this convincing, under-the-skin work. (May) FYI: Murray is an associate professor of law at Loyola Law School in Los Angeles. A chapter of this book appeared in Buzz.